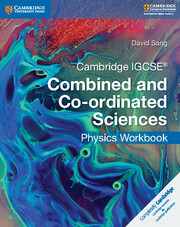 Cambridge IGCSE® Combined and Co-ordinated Sciences Coursebook is tailored to the 0653 and 0654 syllabuses for first examination in 2019 and is endorsed for full syllabus coverage by Cambridge International Examinations. 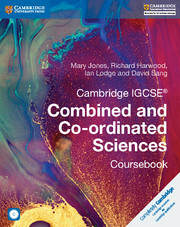 This interdisciplinary coursebook comprehensively covers the knowledge and skills required in these courses, with the different syllabuses clearly identified. Engaging activities in every chapter help students develop practical and investigative skills while end-of-chapter questions help to track their progress. 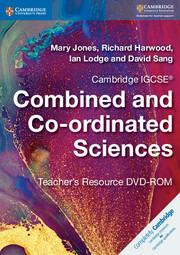 The accompanying CD-ROM contains self-assessment checklists for making drawings, constructing and completing results tables, drawing graphs and designing experiments; answers to all the end-of-chapter questions and auto-marked multiple-choice self tests. 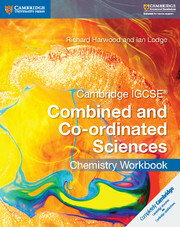 Endorsed for full syllabus coverage by Cambridge International Examinations. Teachers and students can be confident that the coursebook covers the syllabuses in appropriate detail, with syllabus levels clearly defined. Activities in every chapter help students to develop essential practical and investigation skills. Study tips are highlighted throughout to help students assess and develop their own learning styles. The accompanying CD-ROM contains self-assessment checklists for making drawings, constructing and completing results tables, drawing graphs and designing experiments to support the development of these key skills. Self-assessment questions are included throughout every chapter to help students to track their own progress throughout the course, and additional auto-marking multiple choice tests are provided on the CD-ROM for extra practice. Questions at the end of each chapter build in difficulty and assess higher order thinking skills, preparing students for the style of question they might encounter in their examinations. 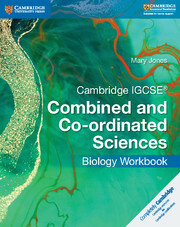 Coursebook forms part of a comprehensive series of resources including workbooks for each science and Teacher's Resources for extra support during planning and delivery of lessons and assessment. C7 How far? How fast?